In 2010, Green Shores NYC, a community non-profit group representing Astoria and Long Island City, turned to The Trust for Public Land to help develop the community's vision of a green, accessible waterfront. To kick-start the project, we conducted a series of listening and brainstorming sessions with local residents, resulting in thousands of comments, ideas and solutions for a revitalized public waterfront. 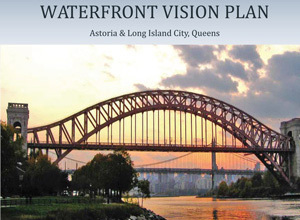 These findings were compiled and presented in June 2011 in the Waterfront Vision Plan (pdf). The plan identifies three guiding principles: a 21st century, healthy and vibrant, and connected waterfront. Currently, the plan is out for comment.